This post can give a whole new meaning to snow and bunny used in the same text. Today I am hunkering down in a blanket, hot chocolate and my stitching and hoping the power says on. We are expecting a blizzard that started at 5:00AM this morning and is supposed to continue until tomorrow morning. The forecast is calling for 12 inches at my house and 35 mile an hour winds and bone chilling cold. 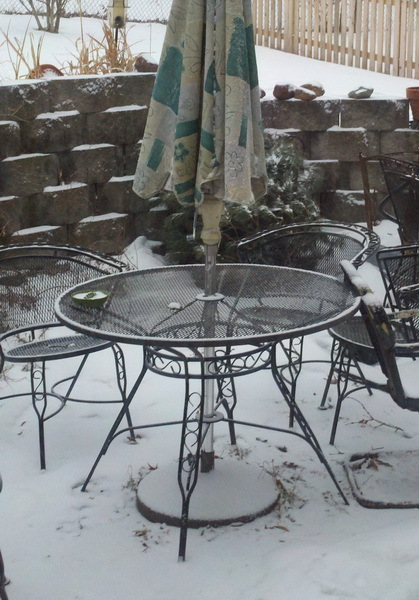 And this was the patio at lunch time. 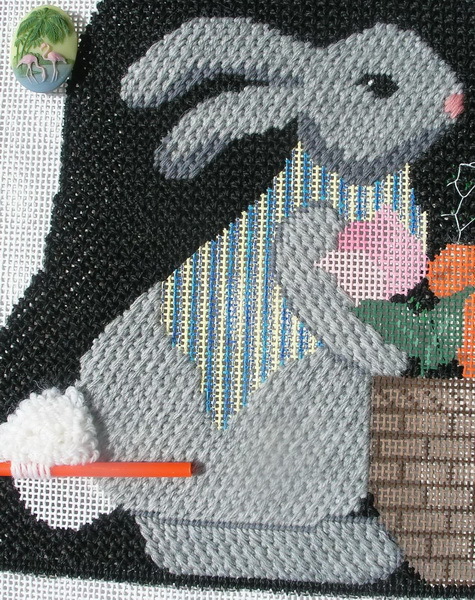 The bunny reminds me of spring and so I will just continue my stitching, watch the news and drink my hot chocolate. I am doing a Turkey Work stitch using Appleton wool for the bunny tail. I am not going to cut these loops, so I want them all uniform in size and used a toy (think it is an old Tinker Toy) to keep the loops uniform in size. I stitch a row at a time around the toy and then remove. If you look at the picture I have diagramed the stitch to show how I do it. It is different than most books show it. Any of us in the Midwest that do this method refer to it as the Joan Lewis method of Turkey Work as Joan is the one who taught us this method. She claimed she found it in a needlepoint book but I have yet to find it and I do own a couple booksJ. The jacket will be a combination of the VanDyke stitch stitched with blue #3 DMC perle cotton and an Encroaching Gobelin stitched with gold #3 DMC perle cotton. 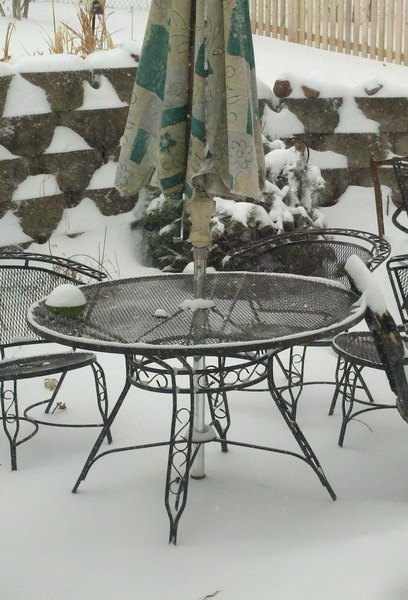 After this I will start the flowers and carrots…if this snow continues and I have power I may post again later in the week. Last week-end I spent marathon stitching, really it started last Wednesday. And as with any deadline of mine life seems to step in the way…until Friday it seemed that very little stitching was accomplished. Random stitching is so-o-o much fun. I love they way you can show direction and it is so cool that there is really no right or wrong direction. I think it stitches quickly too when one does not have to stop for the small daily interferences of daily life and eating & sleeping. The body is a brick stitch over four and will take a bit longer since it is two ply Impressions…can you say lay, laid, laid. Did manage a dinner with my DH at son’s restaurant and stopped to pick up a wedding shower gift (wedding gift too…why make two trips). Saturday became crunch day, I went to the framers and Monday is the drop dead day in order to have back by Sunday April 18th. 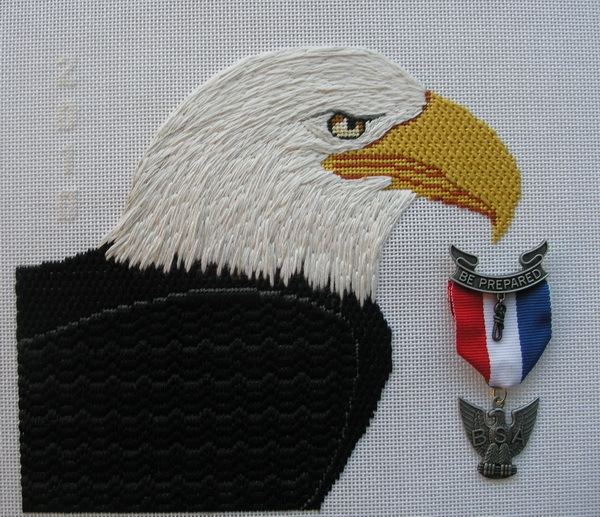 Picked up the Eagle pin at the Scout office attended wedding shower, stopped by the grocery store and stitched the rest of the day. Finished the body and then put the remaining Random stitches over the body. Even manage to start the Bargello pattern for the wing. Sunday attended church and remembered a favorite priest was celebrating his jubilee mass later that morning and having a reception…so I came home started dinner returned to church for jubilee reception, back home with time to stitch and then dinner with the family and finally peace and quite to stitch…Why does it seem to take longer too lay threads when you are under time constraints? But I stitched and finished at12:25 Sunday night/Monday morning. Finally bed and up again Monday morning at 6:30 attached Eagle pin and was off to start my week. 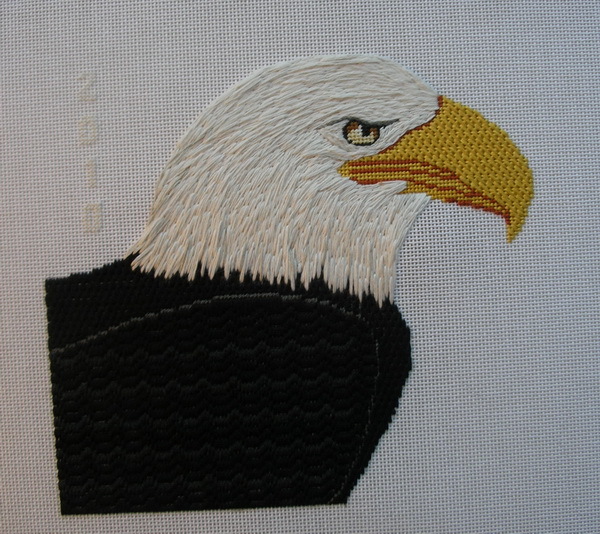 I have carpooled a grandson to and from school, been to the airport and back, dropped off the eagle at the framers, had a great lunch and now I am thinking about bed and a good night’s sleep. Tomorrow is gift for my new granddaughter…not a stitch taken but it will be finished by Saturday so it can go to the framers to have back for the next weekend. 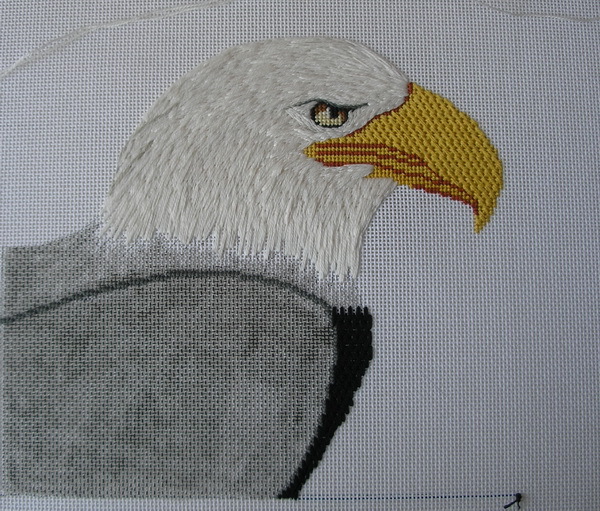 Before I ever stitch, I Goggle pictures of animals if I am not familiar with the animal to see how nature makes this animal’s fur/feathers grow (I did this for the eagle, Leopold, (more about these later) and I had the original picture I used to have Lucy painted). I look at the canvas and get an idea of how I want the fur to I look and visualize the stitched piece. I visualize how I think the areas move or change and I begin to divide the areas into sections. You could make a copy of the canvas and draw lines on the copy to help if you are not a visual person. I look for starting points in the pictures; ( See the top drawing at left: everything somwhat radiates from the red dot but the red T are some of the parts in the fur…just like the parts in our hair.) Then find the best starting point on my canvas. Sometimes there is more than one starting point and sometimes it is not a point but a line or area. There is no one correct way…ever had a bad hair day?! 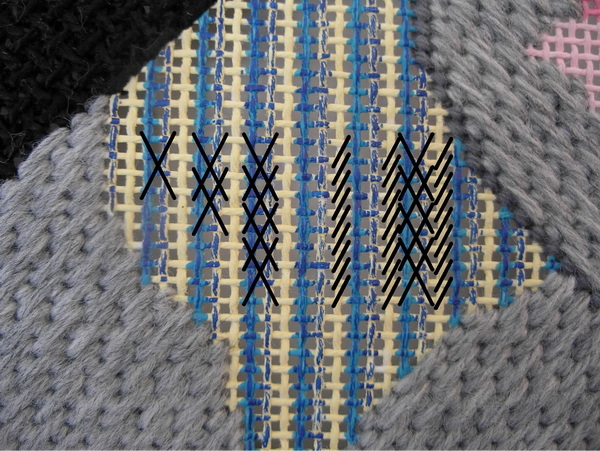 (second drawing are suggsted stitching lines ) Then Unlike the diagram I am showing, I work in small sections. 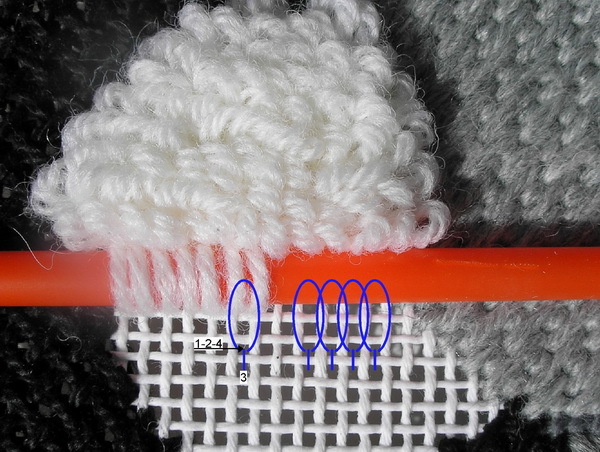 I will randomly pick an area and stitch the first line of fur (for our discussion the purple stitches shown on the diagram) then I will stitch the blue stitches. I fill in this area or sometimes will do several of these divisions (see Lucy picture yesterday); then I fill in these areas. I save the single overstitches until large areas are completed; then you can see the areas that need a different color or need to be lighter / darker.I try to make all the stitches work as I am stitching but I have done my fair share “Frog Stitching.” I have even taken complete areas out, but like any technique, the more you use it the better you get. But the beauty of Random Stitching is that if you have the general direction of the fur correct, you can add subsequent layers of additional color to help make the fur realistic. I do Random Stitching a bit different, but does that surprise anyone who knows me. #1: I use a Chenille needle (I use a Chenille needle for much of my stitching, but this is another day’s blog). Chenille needles are sharp and will pierce not only the threads but the canvas as well. #2: And I stitch from the lower to the upper (clean hole to filled area.) I do this so I can change the direction of the line and still connect to previous stitches. Notice I did not say filled hole, you may not be using a filled hole…I have even been known to pierce the canvas threads if need be. I usually use a minimum of two strands/plies of thread when I am stitching the base layer and I try to split these strands/ plies as I stitch. The base of my Random Stitching is done the way diagramed but then the stitches on top are randomly stitched and can come up anywhere and go down anywhere. Another secret is the thread. I use mostly Epic yarns for my fur (http://www.epicyarn.com/index.html ). I have also used Felicity’s Garden and Newport Harbor threads from Rosebud Designs (http://www.rosebud-studio.com/yarn-menu.htm). All these threads have dyelot changes but when you are doing Random Stitch this doesn’t matter as it would if you were stitching a background with this thread, you want the subtle changes of color for fur. This is a brief general method of how I stitch Random Stitching. My best advice, jump in and try it, practice, practice, practice. Next blog I’ll show you some of the feathers and furs I have stitched. Friday I was looking for something in my den and found “Lucy.” I had not forgotten about her…hard to do since she is at my feet all the time…but her needlepoint had just gotten put aside …out of site out of mind. All that was left to stitch was Lucy’s fur…so this weekend I stitched lots of Lucy. I am one of those people who like to do “Long & Short” stitch. Some stitchers are put-off by the term “Long and Short” Stitch, others go into stitching shock at the mere mention of this stitch…the only thing worse would be to tell these stitchers to use Marlitt. I learned very quickly to avoid the L&S words whenever possible, instead I prefer “Random Stitching or Directional Stitching.” These terms do not seem to strike terror in the eyes of stitchers; their eyes do not glaze over and sometimes you can even get them to try the stitch before they realize that this might be the dreaded L&S. I also think that Random Stitching is one of those stitches you have to be in the mood to stitch. If you are up tight (been there) or tired (been there too), you may not be open to the creative free spirit needed to stitch Random Stitch freely. One of the best books in my library about creative free stitching is Robert Cates’ book: Creative Needlepoint. I bought this book many years ago at an ANG Bookstore but I have seen it on Amazon at different times. 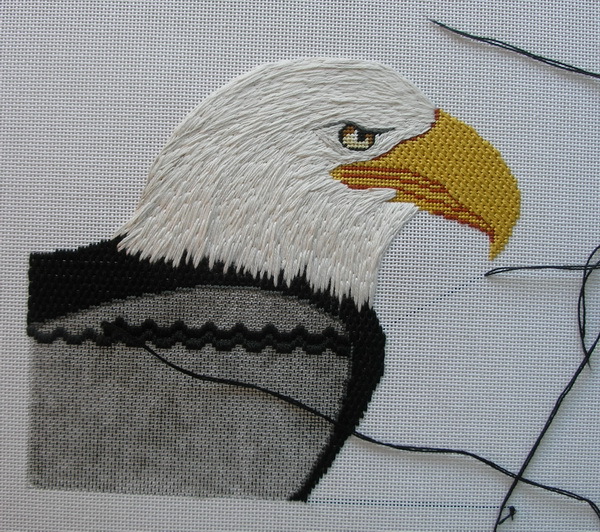 I loved the way he stitched his designs freely and experimented with threads, textures and stitches. He bent the rules and colored outside the lines! So this week I am going to blog about Random Stitching. 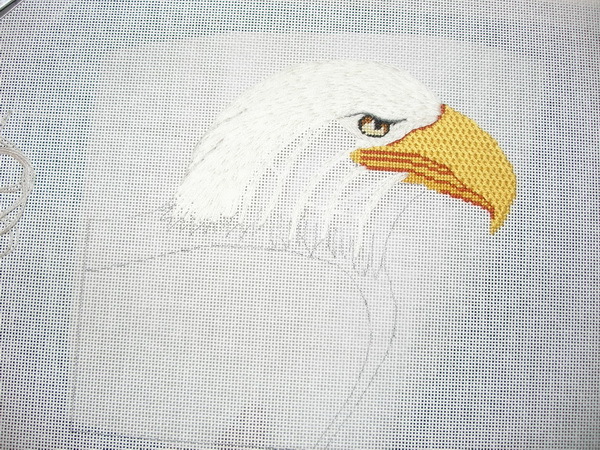 I’ll show you my method of stitching, how I decide where to begin and I’ll also show you some of the different pieces I have stitched.